Other types of evidence-based practices used with children and families could be tailored to children of incarcerated fathers to reduce the deleterious effects of father imprisonment (Murray & Farrington, 2006). Recently, a review of fatherhood initiatives identified 35 effective or promising programs utilizing various strategies with diverse populations, yet only two of these programs focused on incarcerated fathers (Bronte-Tinkew, Carrano, Allen, Bowie, Mbawa, & Mathews, 2007). 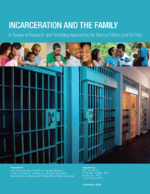 Nonetheless, several of the evidence-based program approaches included in the review and the characteristics that underlie their effectiveness might be effective with incarcerated fathers. More research is needed to adapt and disseminate these approaches within the criminal justice system. Other types of interventions drawn from child welfare, physical and mental health, and criminal justice systems may also help alleviate negative outcomes in families affected by incarceration. Examples include communication about parental absence, stable care placement, contact with the imprisoned parent, and therapeutic services. Nurse home visiting, parent management training, multisystemic therapy, and multidimensional treatment foster care are all community-based parenting programs are other promising approaches. Financial assistance, cost subsidies, and prisoner employment may help to reduce economic strain among incarcerated fathers and their families. Finally, criminal justice-based approaches such as introducing anonymity of offenders, implementing restorative justice approaches, and using strengths-based sentencing can help reduce the stigma associated with incarceration that can be harmful to children and families. Future research should address the efficacy of these services with incarcerated families and examine how organizational climates and integrated service delivery strategies can facilitate these approaches.